It will only be available for the first year of the 2019 Mercedes-AMG G63’s production. This week, based on the , and with it comes the obligatory limited edition launch model. Like most Mercedes vehicles, a limited-run Edition 1 version of the G63 will be sold during the first 12 months of production, featuring an assortment of visual tweaks both inside and out to help it stand out. Images posted by show the Mercedes-AMG G63 Edition 1 finished in matte black bodywork that gives the off-roader a suitably menacing look. Even the massive 22-inch wheels are blacked-out. Complementing the stealthy look are subtle red accents on the side mirror caps, and alloy wheels. Grey graphics are placed on the bottom of each side of the SUV, while the brake calipers are adorned with AMG lettering. The black and red theme continues inside the cabin, with red-stitched black leather seats, red bolsters, and red-tinted carbon-fiber trim. And of course, you get the same imposing Panamericana grille and obligatory side exhausts that distinguish AMG models. 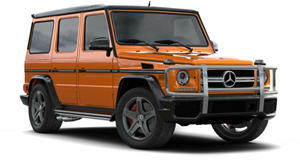 Since this is an appearance package, the Edition 1 version is of course mechanically identical to the G63. Under the hood is the latest version of AMG’s ubiquitous 4.0-liter twin-turbo V8 engine that delivers monumental performance. A whopping 577 horsepower and an earth-moving 627 lb-ft of torque is sent through a nine-speed automatic transmission to all four wheels with a 40/60 front-rear torque split. Despite the SUV’s considerable size and weight, 0-62 mph takes just 4.4 seconds. Top speed is 137 mph, or 149 mph with the optional AMG Driver’s pack. US sales for the 2019 Mercedes-AMG G63 will start towards the end of this year, while the potent off-roader will make its world debut at the Geneva Motor Show next month.